Qantas’s credit outlook has been lifted from “negative” to “stable” on the back of lower fuel prices and slower capacity growth. Ratings agency Standard and Poor’s (S&P) revised its credit outlook for the Australian flag carrier on Wednesday, saying the airline was benefitting not only from more benign domestic market conditions and the recent steep decline in the cost of oil, but also a weaker Australian dollar. S&P credit analyst Graeme Ferguson said changing the outlook from negative to stable reflected the “meaning improvement in Qantas’ operating environment”. “The stable outlook reflects our view that competition across Qantas’ route network will be contained and that the airline will maintain its dominant domestic market position,” Ferguson said in a statement. S&P lowered its credit rating on Qantas from BBB- to below investment grade, or “junk”, status at BB+ with a negative outlook on December 6 2013. The downgrade came at a time when Qantas lobbying the federal government to guarantee the airline’s debt and a day after the company announced 1,000 workers would lose their jobs. S&P said on Wednesday it expected the recent decline in oil prices would enable Qantas to “recover its credit metrics at a much faster pace than our previous base-case expectations”. However, it was “not likely to be raised for at least the next 12 to 18 months”. “Over the medium-to-long term, positive rating action would require evidence of a more robust and versatile operating platform,” S&P said. S&P also cautioned that the underlying demand conditions were expected to remain weak for the Australian airline industry. Qantas was forecast to report its best first half result since 2010 when it handed down the 2014/15 half year financial report on February 26. The company has guided the market to underlying profit before tax for the six months to December 31 2014 in the vicinity of $300 million to $350 million, with all its operating units expected to make a positive contribution to the result. 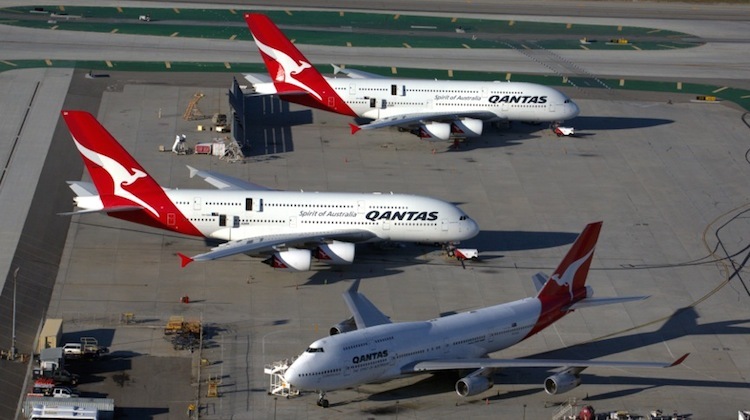 Qantas posted an underlying loss of $252 million in the prior corresponding period. The company’s shares were up 1.2 per cent at $2.63 in afternoon trade on Thursday, its highest level since early 2011. I am a big supporter of QANTAS and have been a QClub member for over 15 years so its good to see the airline turn around. However, like many WA residents this loyalty has become somewhat tested internationally when considering we cannot fly on a full service carrier direct to a major priority destination such as Singapore, a choice not even available direct through the OneWorld alliance. With the new Virgin terminal opening soon and the multitude of options available through its alliance with Singapore Airlines, given its now comprehensive schedule to the Eastern States and directs to NZ and Middle East I would suggest QANTAS either gets greater RED ROO options out of Perth or suffer further degradation of its customer base. Jetstar is not a viable or comparable option. I’m sure if SIA can support 3 and 4 times daily flights plus have SCOOT run the route, I’m sure a daily QF A330 linking into the Jetstar Asia network on short haul would certainly be viable. Maybe if QANTAS stopped thinking Sydney centric and looked beyond the Blue Mountains it would appreciate that WA people want service as much as over East. I like many will be considering jumping airlines once the Virgin Terminal is complete with its new state of the art lounge and direct international transfers to either premium of budget options. You are spot on the money -especially after just reading about a 4th B787 operator into PER and of course EK upgrading to A380 services. Good news on the seasonal flights to YVR – how about trying same out of PER?